lossesCell = elec_getPowerLossTimeSeries(node) calculates dissipated power losses for blocks in a model, based on logged simulation data, and returns the time series data for each block. Before you call this function, you must have the simulation log variable in your current workspace. Create the simulation log variable by simulating the model with data logging turned on, or load a previously saved variable from a file. The elec_getPowerLossTimeSeries function calculates dissipated power losses for each block that has a power_dissipated variable. All blocks in the Semiconductor Devices library, as well as some other blocks, have an internal variable called power_dissipated, which represents the instantaneous power dissipated by the block. Some blocks have more than one power_dissipated variable, depending on their configuration. 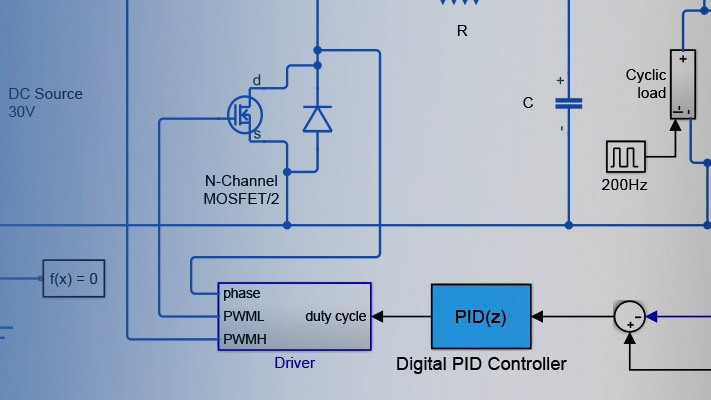 For example, the N-Channel MOSFET block has separate power_dissipated logging nodes for the MOSFET, the gate resistor, and for the source and drain resistors if they have nonzero resistance values. The function sums all these losses and provides the power loss value for all of the blocks as functions of time. If node is the name of the simulation log variable, then the table contains the data for all the blocks in the model that dissipate power (that is, contain at least one power_dissipated variable). If node is the name of a node in the simulation data tree, then the table contains the data only for the blocks within that node. lossesCell = elec_getPowerLossTimeSeries(node,startTime,endTime) calculates dissipated power losses and returns the time series data for time steps from startTime to endTime. 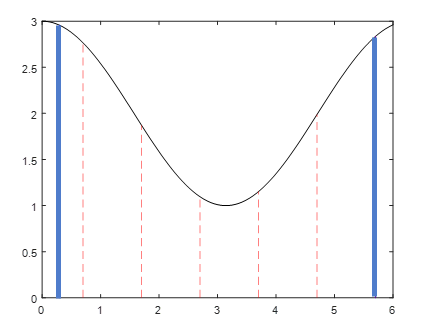 If startTime is equal to endTime, the interval is effectively zero and the function returns the instantaneous power for the time step that occurs at that moment. If you omit these two input arguments, the function returns data over the whole simulation time. 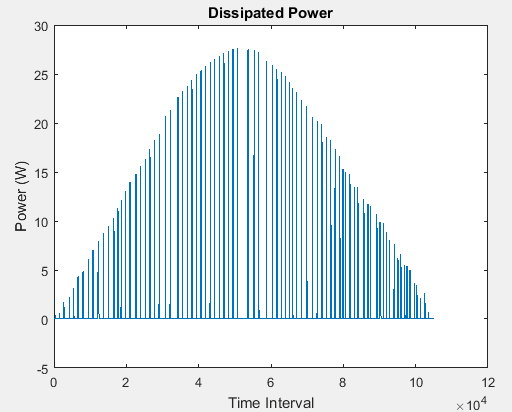 lossesCell = elec_getPowerLossTimeSeries(node,startTime,endTime,intervalWidth) calculates dissipated power losses and returns the time series data for time steps from startTime to endTime, averaged over the time intervalWidth. If you omit the intervalWidth, or set it to 0, the function returns the instantaneous data, without averaging. If you omit all three optional arguments, the function returns the instantaneous data over the whole simulation time. This example shows how to calculate instantaneous losses based on the power dissipated and return the time series data for all time steps in the entire simulation time using the elec_getPowerLossTimeSeries function. 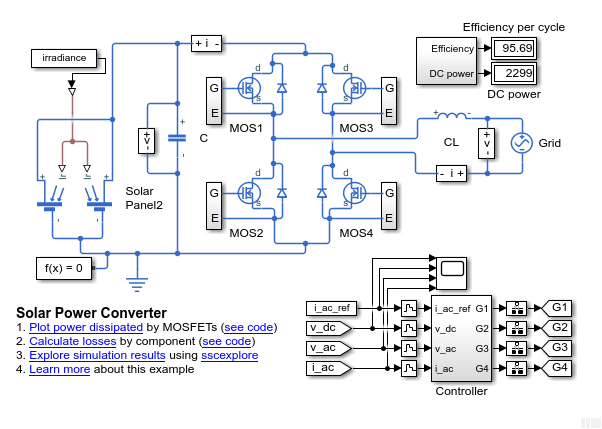 The simulation log variable simlog_ee_solar_converter is saved in your current workspace. Calculate dissipated power losses and return the time series data in cell array. View the time series data. From the workspace, open the lossesCell cell array, then open the 201804x3 double numeric array for the ee_solar_converter.Diode1.diode. This example shows how to calculate instantaneous losses based on the power dissipated and return the time series data for all time steps in a specific time period using the elec_getPowerLossTimeSeries function. The model simulation time (t) is 1/60 seconds. Calculate dissipated power losses and return the time series data in cell array for the second half of the simulation cycle, when t is between 1/120 and 1/60 seconds..
View the time series data. From the workspace, open the lossesCell cell array, then open the 105197x3 double numeric array for the ee_solar_converter.Diode1.diode. 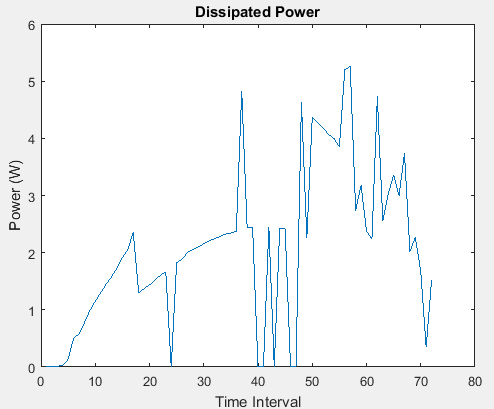 This example shows how to calculate losses based on the power dissipated and return the time series data for a specific time period with averaging applied over intervals of a specified width. The model simulation time (t) is 1/60 seconds. 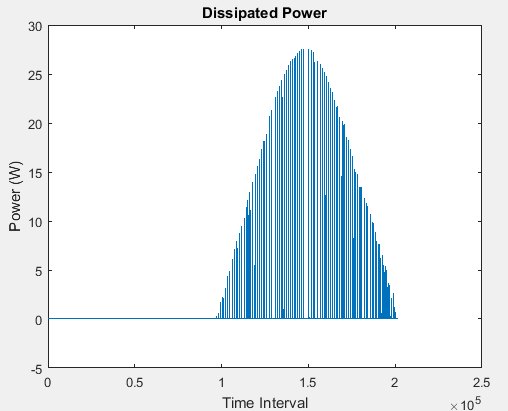 Calculate the average dissipated power losses for 1.1e-4 s intervals and return the time series data in cell array for the period when simulation time, t, is 0.008–0.017 seconds. The first two columns contain the interval start and end time. The third column contains the power loss data. In this case, to use averaging intervals that are equal in width to 1.1e-4 seconds, the function adjusts the start time for the first interval from the specified value of 0.008 seconds to a value of 0.0081 seconds. There are 72 intervals of 1.1e-4 seconds. Size of the time interval for calculating the average power dissipation, specified as a real number, in seconds. If specified, the function returns data for time steps from startTime to endTime, averaged over the intervalWidth. If you omit the intervalWidth argument, or set it to 0, the function returns the instantaneous data, without averaging. If all the optional arguments are omitted, the function returns the instantaneous data over the whole simulation time. The elec_getPowerLossTimeSeries function will be removed in a future release. Use the ee_getPowerLossTimeSeries function instead. The only difference between these functions is the function name. To prevent your code from generating an error when the function is removed, update to the new function name.